What is comfort food? Comfort food to me evokes memories of happy times and yummy deliciousness. This dish fits the bill. 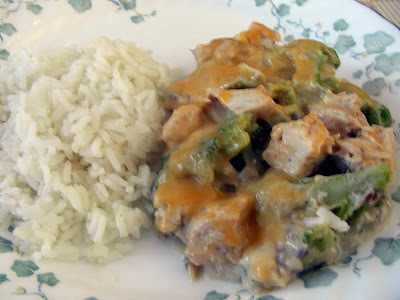 I have been making this for many years, and have many fond memories of serving this to my family and friends, Chicken and Broccoli is my kid's favorite request for Birthday dinners. I have made many of these dishes for people that have lost loved ones, fighting cancer, or had new babies. Chicken and Broccoli is feel good food for me. Back in the day when I first started making it, you had to bake it in the oven. Now if need be, you can cook it in the microwave. Please, don't cringe, but this dish has Cream of Mushroom or Chicken soup, which was staple in my house for many years. There is a layer of broccoli and chicken combined with soup, mayonnaise, and curry powder with cheese on top. One of these days, I will make a sauce from scratch for this dish, but not now. If you are having a very harried day with the crush of Christmas activities, this dish is perfect. Once the chicken is poached, you can have it ready to eat in the time it takes to cook long grain rice. I usually serve the rice on the side, but when I take it to someone to enjoy, I cook the rice first, and then put the cooked rice in the bottom of the casserole dish first, and the rest of the ingredients. if you have leftover chicken that works, too, or if your really crunched for time, you can use a cooked rotisserie chicken. I use chicken breasts, but you can use whatever type of chicken you prefer. You can also use leftover turkey. Let's make Chicken and Broccoli. Spray casserole pan. Par cook broccoli in microwave, for about 4 min., drain. Chop chicken breasts and layer over the broccoli in casserole pan. Heat undiluted soup, Mayonnaise or Miracle Whip, and curry powder, till heated through, stirring to combine. Pour soup mixture over chicken and broccoli. Microwave on high for about 5 min, depending on your microwave. You may also bake in the oven, 375 degrees, until bubbly, 20-25 min. Remove from microwave or oven, and top with grated cheese. Enjoy! Oh, Becky! This looks absolutely perfect. The ideal comfort food! This is my kind of meal, and while I don't readily admit it, I do have a can of Cream of Mushroom in the back of my pantry! I had to respond to you... you made me literally laugh out loud with your comment on the macaroons! I remember your post from yesterday saying it was 1 above zero, and today you were feeling the "island breezes"! I hope it warms up a bit for you!! Very yummy, this is ultimate comfort food for sure, my daughter would love this with rice! Natasha- Thank you for your comment. It's very easy to make. My sister and I grew up on chicken and broccoli (and I think we would have liked your version a lot more...my mom kept our dishes way too simple!) This does look like perfect comfort food to me. Thank you for sharing. I hope you have a wonderful weekend! Monet-It is good. Give it a try, when you're crunched for time. Have a wonderful weekend! The weather here is supposed to be "frightful". What a fabulous meal!Looks so yummy!